So, New Caledonia is considered a "biodiversity hotspot" and has a high ratio of endemic species. (Yes, I know my last post was also about New Caledonia, but frankly, it's a rather amazing place.) For example, the island has approximately 3,270 plant species and 74% percent of those are endemic. This isn't particularly surprising consider New Caledonia is an isolated island and with such isolation, some rather unique life forms have developed including, Parasitaxus usta (or, as it is commonly known, the Corail), the only parasitic conifer in the world. 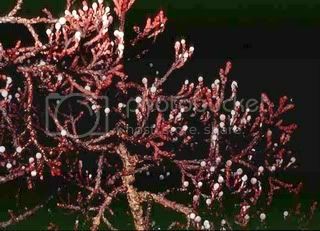 The Corail seems to lack proper roots and it attaches itself to the roots of Facatifolium taxoides and presents a "vesicular-arbuscular mycorrhiza" sort of parasitism. In other words, although the foliage of the Corail contains a few chloroplasts it does not photosynthesize particularly well and instead transfers sugars from the host plant via a fungal middle-man. Although, it seems that the Corail can also form a direct connection with the xylem of the host plant and in this way it can scavenge nitrogen. The plant itself is extremely delicate and, apparently, even stepping on the new shoots can kill them. Also, before the Corail was discovered to be parasitic, any attempts to extract it lead to the death of the specimen. 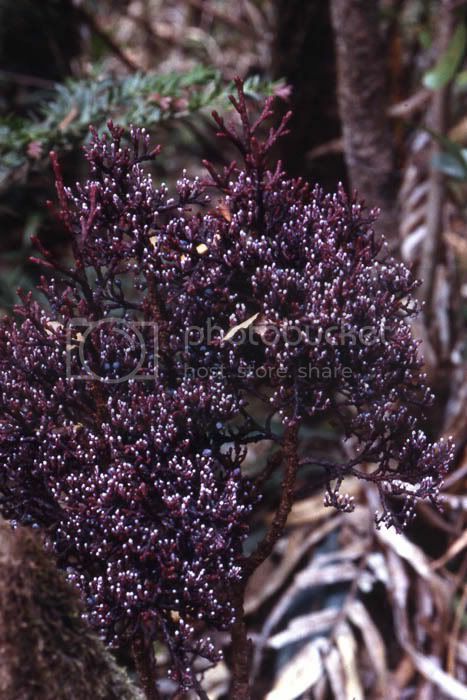 Full grown, the Corail is a woody shrub with red or dark purple scaled leaves and is, honestly, a rather bizarre looking plant. I feel unique species like the Corail serve to emphasize just how amazing island communities really are. In complete isolation from the mainland, species are free to develop and many have worked themselves into some rather unusual niches. Even though New Caledonia is relatively small, there are five different plant families and one hundred and eight genera which are endemic. There are only a few other countries with more endemic (including Australia and South Africa) and they are considerably larger than New Caledonia.